Islamabad – New Pakistan Prime Minister Shahid Khaqan Abbasi has a good reputation for being a hardworking politician and for never losing any elections since he entered the political field in 1988. He was elected to parliament six times since 1988, thereby winning all the races he has entered. He is also a loyal follower of former Prime Minister Nawaz Sharif. This is the reason why he was chosen to succeed him after a court decision that led to his resignation. “I have faith that the real Pakistani Prime Minister Nawaz Sharif will return to his post,” she added. He called for respecting the constitution, saying that political life, which had its reputation tarnished, will regain its respect. 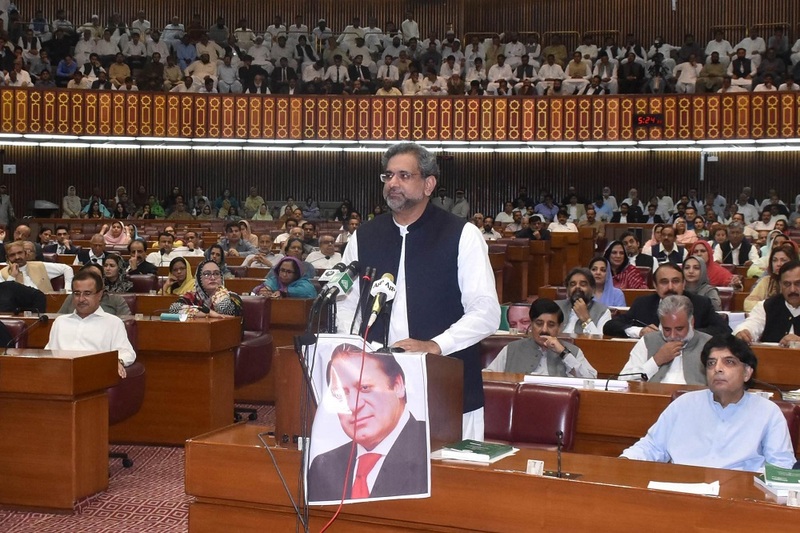 In his first speech since being elected as PM, Abbasi focused on reviving the economy and improving the legal system throughout Pakistan. Born in Karachi in 1958, he received his early education in Pakistan before traveling to the United States where he earned a Bachelor’s degree from the University of California. He then pursued a master’s degree in electrical engineering from George Washington University in the US capital. Before entering the political field, he served as engineer in several projects in the US and Middle East. He also worked in the oil industry sector in Saudi Arabia. Abbasi hails from a family that is active in politics. His father Khaqan Abbasi was a general in the airforce and worked in the country’s national assembly He also served as a minister of production under the premiership of Muhammad Zia-ul-Haq. PM Abbasi’s sister was also a member of the ruling party in Pakistan in the 1990s. The premier also owns private jets that operate in Pakistan and in 2003, he established AirBlue Limited, an aviation company that he chaired until 2007. He also acted as president of Pakistan International Airlines between 1997 and 1999 during Sharif’s second term as prime minister. On August 1, Abbasi was chosen to become premier following Sharif’s ouster over his links to the so-called “Panama Papers”. On the political level, Abbasi is known for the service he provides for his electoral district of Murree. Mohammed Islam, a government employee who hails from Murree, said that Abbasi worked tirelessly to establish a network of roads in the area. He also worked to build schools and hospitals in the district. Abbasi had however been subject to accusations, along with Sharif and others, in the famous plane hijacking incident during the term of Prime Minister General Pervez Musharraf in the late 1990s. Abbasi was accused of preventing the landing of a plane, which was transporting Musharraf from a visit to Sri Lank to Karachi airport. It was said that Abbasi came under great pressure to testify against Sharif in the 1999 incident, but he refused. With his election, Abbasi, 58, becomes the 18th prime minister of Pakistan. Generally, he is seen as very smart and as one of Sharif’s most loyal followers. It is viewed however that his tenure as premier will be temporary and that it is paving the way for Sharif’s younger brother Shehbaz. Nawaz himself had said that Abbasi will remain in his post for 45 days. During this time, Shehbaz will attempt to win national assembly elections that will make him qualified to become prime minister. Informed sources in Islamabad said however that Nawaz may change his mind about Shehbaz becoming premier. A member of the ruling Pakistan Muslim League said he believes that Abbasi will be allowed to complete his term as premier. Married with three children, Abbasi is considered to be one of the wealthiest lawmakers in Pakistan with a fortune of 1.3 billion rupees (12 million dollars). He holds stocks in AirBlue and owns a house in Islamabad, as well as a restaurant and property in Murree. Abbasi became prime minister at a tense political time in Pakistan due to the disputes between its various parties. There are fears in Islamabad that the upcoming days may witness a direct confrontation between Nawaz Sharif and a number of central institutions in the country, such as the military and supreme court. It is certain that these confrontations, should they happen, will harm the political process in the country. Political analysts said that Abbasi will have to find a balance between the rival parties if he wants to keep his position. The military after all had conspired to topple Sharif, but Abbasi and Shehbaz both have strong ties with this powerful institution.